In May I managed to make it to the Auckland Zoo for a look around and to the Waitomo Caves for some Black Water Rafting and Glow Worm watching. Also in the month lacking any forward motion on some other TV ideas I made the decision to come back to Canada and prepare for my motorcycle journey from Calgary to Argentina beginning in Sept 2011. Full blogging in Sept, Ouch! or Yay?! The trip has been a couple years coming so let's see how far I get! The plan is to ride 25,000km in 6 months, SCUBA and Surf the West Coast of the Americas and see all the other tourist stuff along the way to Argentina. Stay tuned. Still some good days in NZ yet! Spent a nice day out at the Zoo with lovely Lenka who loves animals more than anyone I have ever known! A little bigger than Wellington's Zoo as you would expect it had quite a bit to offer. But I wouldn't get to excited about the feeding time shows through out the day as they are pretty low key if they happen at all. Lenka feeding the father giraffe. A Flamingo to lazy to tuck in the old leg. A Meerkat with that awesome inquisitive look. Another Meerkat with a different kind of look. With out the glass in front of the primate the scarf would have been lost. My fear of birds doesn't seem to lessen with size. This is what a Tiger would look like on vacation in Hawaii. Unfortunately there are only 450 Sumatran Tigers left in the world, so let's stop using Palm Oil which is the main reason for the deforestation of Sumatra (my little political shout for the month). Beautiful lions, the head of the pride with the more filled out mane on the right. Black Water Rafting and Glow Worm Caves, sounds amazing? It's ok...A good experience, but not one that you would say "let's do it again". Probably my high expectation that I was going in a raft and ended up in an inner tube didn't help sell Black Water Rafting. 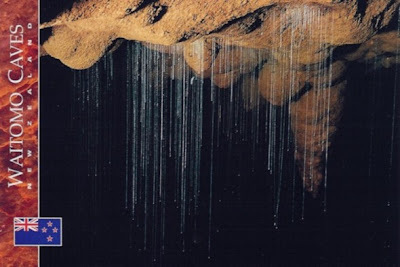 Waitomo, 2 hours southwest of Auckland, is famous for its Glow worm caves. One of the top tourist destination on the North Island it was one of the few things I hadn't done in NZ. The caves are full of incandescent little worms trailing catchment lines off them. Very chilled out as we floated by in our tubes. Fun fact: The florescent green worms are actually maggots, but don't tell anyone. It was a good day and the Black water guys entertained us when they could although I'm not sure you need to spend $100 each to get in the cold water floating down a river on an inner tube stopping more then you are going to see the caves, but it was one way to do it. The entire 3 hours you find yourself anticipating something is going to happen, but it never does. Still it was an experience I have never had before. Unfortunately we could not get any photos of the worms, but here's a reference. I guess you will have to come to NZ to see them, ha! One of the 1 metre waterfalls you stand and jump backwards off. Little finishing game, I missed long which is better then missing short, isn't it? Shot of the boat "Timeless" I have been sailing on every Friday in the 4pm Rum Race (yes, the winner gets a bottle of rum). Wayne Ferguson - Skipper/Owner.